They look like small brass plates, in the middle of which there are put knob-like handgrips. These are plates made from bell metall with knob-like handgrips in the centre. 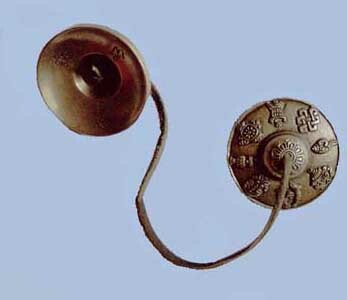 These are two planished brass plates, the grips (knobs) of which are connected by a small strap. 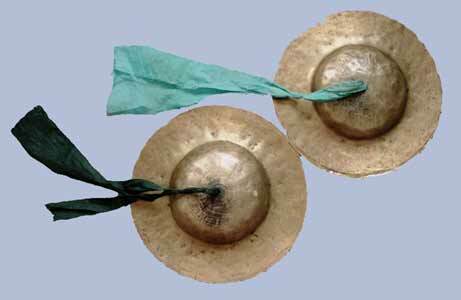 On the occasion of church services a Lama bangs two small plates against one another, thus producing a sound similar to the sound of a little bell, but significantly smoother and more melodic. These are the major instruments of the orchestra. 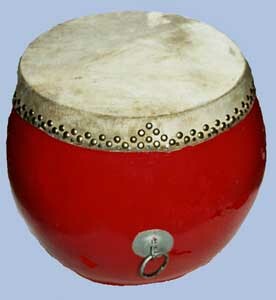 Apart from them, there are also smaller drums (Mongolian: Damar) that are tuned differently. They are remarkably broad. The drumsticks are very often bent in a S-form and sometimes have their ends in the form of the head of an elephant-seal or sea elephant. The trumpets made from copper have a length of 2 to 5 metres. They give a bloodcurdling bass note which then swells and dies away. 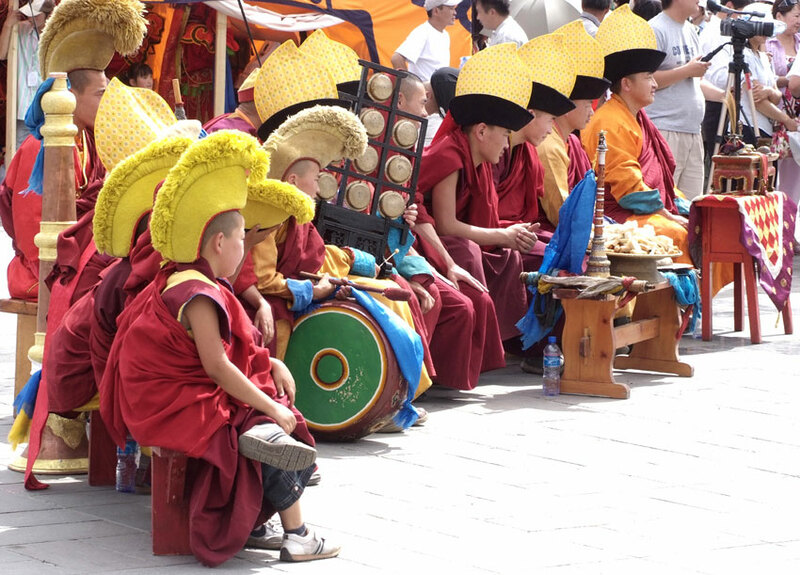 As the legend has it, his Indian friends gave Padmasambhava these instruments in order to offer him a replacement for the bellowing of the heavenly elephants he could not find an opportunity to listen to in Odijana where he had been invited to. White shells with whorls leading from the left to the right handside are considered a lucky charm, and therefore they are very much in demand. In order to blow them, they are equipped with a mouthpiece made from brass. According to a Lamaistic legend, Buddha himself gave this instrument to the Dragon King as a present. It has a similar form like an oboe. Louver and mouthpiece are enclosed with silver or gold. 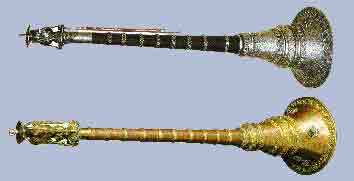 These flutes are also used as ritual objects. They should be made from femurs of human beings who had very high or low social ranking, who died of an infectious disease, or who were murder victims. "The most magic effect, however, is said to be associated with a gangling that was manufactured from the left femur of a 16-year-old Indian who had been member of the priest caste." A trumpet made from copper and decorated with rich ornaments. They are also made from copper and give sound by means of drumsticks. 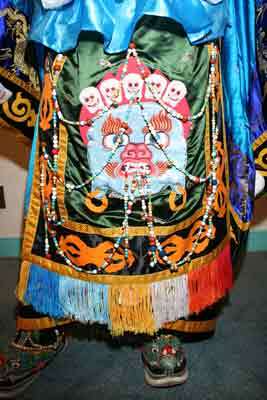 The mask costumes are very colourful and decorated with numerous embroidered ornaments. The costumes of the deity masks are fabricated from expensive cloths, mainly from brocade or atlas silk, whereas the fabrics for the costumes of the other masks are made from wool or cotton. The design of the masque costumes is rather unique. The sleeves are tapered to produce a tip, and they are cut rather loose in order to keep therein arms and other objects. The large collars (capes) fall loose, reaching beyond the shoulders. Religious symbols are sawn on the costumes in the middle of the broad aprons. The major masks wear a decorative cape over the whole costume (Ruujin), which consists of about eight pearl strings made from human or animal bones. In Mongolia there can also be found capes made from ivory. 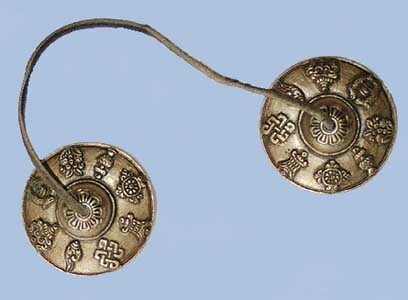 The joints are decorated with Buddhist symbols. Even the boots are decorated with heads of sea monsters (Makara). These are meant to put off demons, and while dancing, the dancers try to crush their bodies by means of predetermined steps. 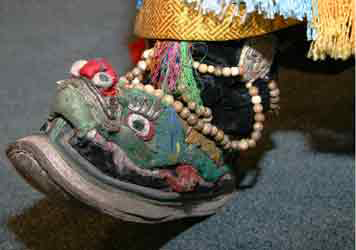 The sole of the foot is pulled to the front top in order to not damage the soil while kicking and crushing the spirits. For the production of these masks, a mass made from papier-mâché (also in Mongolia) as well as a thin and embossed copper sheet are used. In areas with larger wood resources than in the Tibetian uplands, such as in Sikkim and Bhutan, the masks are also carved from hard wood. There the humid climate would quickly destroy the paper mass. The people from Tua, on the other side, fabricate their masks from leather.